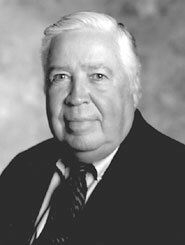 Born on August 18, 1929, in Charlotte, Stuart Dickson and his brother would take the R. S. Dickson & Co. and build a congolmerate, Ruddick Corporation, into one of Fortune Magazine's leading firms. Junior Achievement Founded in 1919 in Gastonia, R. S. Dickson & Company started out investing in textile firms. In early 1929, the company moved to Charlotte and continued its investment banking business, as well as operating textile firms. Rush Stuart Dickson grew up in Charlotte. He graduated from Davidson College in 1951. He joined the financial investment firm of Goldman Sachs in New York City. When his U. S. Army Reserves unit from North Carolina was put on activation notice for the Korean War, Stuart returned to Charlotte to work at R. S. Dickson & Company. 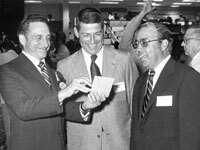 In 1968, Stuart and Alan Dickson took the diversified holdings of R. S. Dickson & Company and created Ruddick Corporation  traded on the New York Stock Exchange. Stuart was chairman of the new corporation until 1994, when he became chairman of the executive committe. In 1969, Ruddick Corporation acquired the 32-store Harris Teeter Super Markets. The new conglomerate had 8 major components ranging from investment banking, to sewing threads, to grocery stores, to computers to business forms to golf carts. Annual sales were $150 million. Today, Ruddick Corporation has two major companies - Harris Teeter grocery stores and American & Efird  with annual sales of more than $2.6 million. It is one of Fortune Magazine's top U.S. companies. Harris Teeter is one of the leading regional supermarket chains with about 150 stores. America & Efird is one of the world's largest manufacturers and distributors of sewing thread for industrial and consumer markets. Stuart has served on boards of major national corporations, including Textron and Dimon. He also has served on the boards of numerous schools and colleges, as well as numerous community groups. These organizations included chairman of Carolinas Healthcare System, Foundation of the Carolinas, Foundation for the University of North Carolina at Charlotte, Davidson College, Johson C. Smith University, Queens College, Wake Forest University and others. files may take a a moment.